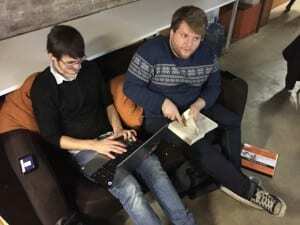 The 6th International Week (iWeek) at the University of Liepaja, Latvia took place between 17th -22nd November, and the co_LAB team were invited to take part in the proceedings. iWeeks are where staff and students from across Europe meet at one University to work and collaborate with one another, through workshops, talks and networking events. Tuesday was a national holiday in Latvia to celebrate the anniversary of their independence, so at MPLab some of the international guests ran workshops for young children and big children alike, whilst we were given a guided tour of the city followed by a trip to the war town of Karosta. 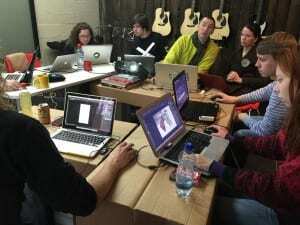 The following days it was time to get to work, Clive and Louise ran a 2 day workshop entitled co_LAB|BEAM (#beamteam) in which they created an original augmented virtual map of the city. Using images sourced collaboratively, the team made a socially created environment, which captured the city and its inhabitants. Through image manipulation, new composited views unfolded, presenting connections and reflections of Liepaja. The results were a series of animated gifs and composited images that they projected back onto the walls of the city. Daisy and Maria took part in this workshop, along with a mixture of Dutch and Latvian students. 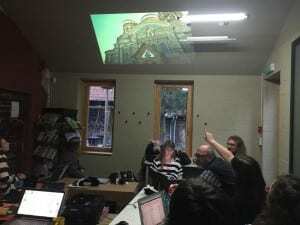 Graham ran a 3 day workshop with Jamila Faber called re:VERSE where they provided an opportunity for students to work in collaboration with each other to produce an original audio visual art installation. Using the city of Liepaja as inspiration and in part an instrument, participants recorded, mixed and presented a song for the city. Simultaneously, visuals were captured, manipulated and edited and presented in support or conflict to the audio. They constructed an original presentation space through which individual members of the public experienced their creation. 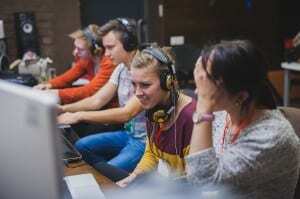 The students involved were all Latvian from a mixture of backgrounds and courses. Matt and James took part in the workshop run by Tibor Kecskés (HU). The workshop started with a lecture on Spontaneous Architecture and Design, followed by a conversation and debate, as well as short presentations by the participants on spontaneous patterns in the neighborhood (at home, in the city, on the net or anywhere else). Using various objects or used materials for the purpose of reinterpretation, new objects or installations with a different, foggy meaning (or no meaning at all) were created. Alongside the workshops there was also a series of Talk and Show events each evening. Artists talking about their work and professors talking about their institutions. We were asked if we could give a talk about Lincoln, the University and co_LAB, which we did as a complete team, everyone taking the floor to talk about their course and the projects they were working on. This was all recorded and streamed live across the web where the rest of the team tuned in from home. It was really great to see the lines blur between staff and student throughout the week. We left Lincoln as 3 members of staff and 4 students, we returned from Latvia as simply tired yet inspired members of the co_LAB movement.